Members' names and teaching details are maintained in a database at the MTA’s office. When the general public make enquiries regarding music teachers, they are referred to a member in a suitable location. Those seeking teachers are also able to take advantage of the “Teacher Search” section of our website to assist with finding a teacher. The MTA Council’s Executive Officers administer a Benevolent Fund. This fund exists solely to help and support teachers and fellow musicians and their families in times of hardship, brought about through illness, accident or financial distress. Each case is treated with the strictest confidence. Donations to the Benevolent Fund are always welcome. The locum service is available on a short-term basis for teachers who need to take a leave of absence from their private teaching studio. You may be assured that your studio will function in a professional manner during your absence, as the MTA will only offer the position to a suitably qualified teacher. Appointment is, of course, at the discretion of the studio owner. Aon - With Aon, members are entitled to an automatic 20% no-claims discount when you take out our Equipment Insurance which covers your instruments worldwide, whilst in storage, use and transit. Don’t forget, we also offer a tailored insurance package for music teachers. Members receive the Association’s magazine, The Studio on a quarterly basis. The Studio contains news and articles of interest to music teachers. 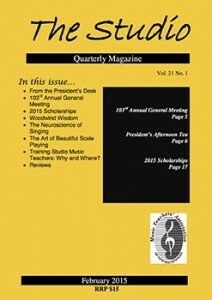 Members are now able to access the magazine online. All members are encouraged to attend the various professional development workshops, seminars, master classes and in-service courses that are offered by the MTA throughout the year. Details of these events are published in The Studio and on this website. The Association offers various Scholarships from time to time, some of which are only available to the students of MTA members. Details of Scholarships are published in The Studio and on the website. Each year the MTA holds Junior Music Festivals at various metropolitan and country venues for students, aged under 16, of any instrument or voice. The MTA enjoys bringing its members into contact with each other. Various events are organised throughout the year and are advertised in The Studio. Full members of the MTA are entitled to append the post-nominals MMTA after their name.